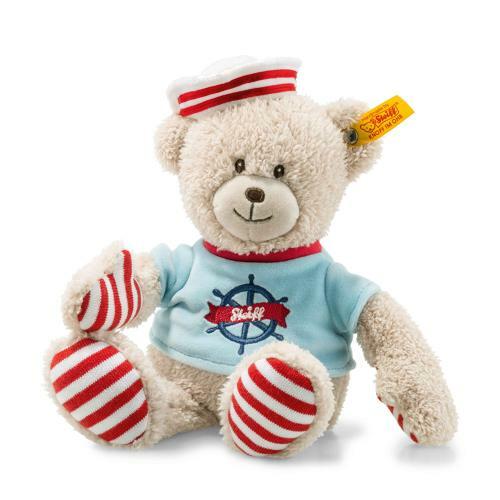 Down by the Sea Sailor Teddy bear measures 26 cm and wears a red and white striped cap which is stitched on. This colour combination is repeated on his paws. His eyes are lovingly stitched on. The light blue T-shirt bearing the Steiff logo is removable. He is good training for the motor skills of little hands. Bean bags are sewn in his paws and tail so that he can sit or lean. The velvety soft Teddy bear is made of high quality plush for baby's soft skin.